Today there was a car assisted ride to Hipley from Petersfield which will be the subject of a separate Report. 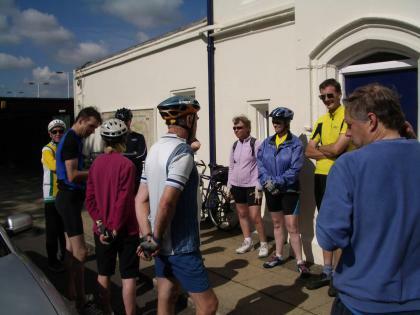 This was the fast ride starting from Chichester to join the main ride at Petersfield. We met 8.30 Chichester Cross and there were 4 including myself with Chris, Ann and Mike Trussler. We enjoyed a beautiful day with clear blue skies although a strong NW headwind to Petersfield. We took a fairly direct route via Compton, West Marden and Harting. We did not get to Petersfield early enough to go to Tesco for breakfast as planned. We went on to the Railway Station to meet another 8 riders on the main Ride. Colin and Adrian joined us for lunch at Hipley. In the afternoon we left the main group at Clanfield and headed back via Chalton to stop for Tea at Rowlands Castle. Mileage to and from the centre of Chichester was 62 and my mileage to and from Pagham was 75. We met at 1.00 at Bognor Library and despite threatening skies 8 turned up including myself with Dawn, Fred, Roy, Philippa, Jo, Val and Janet. There was a brief light shower as we waited but the rest of the afternoon was dry despite dark clouds in places. On the route out we avoided traffic taking the cyclepath under the Upper Bognor Road and then the playing fields cyclepath past a Cricket match to Felpham. Then it was estate backroads via Middleton, Ancton and Elmer. Then along the beach with some cycling and some walking to stop for our picnic at Climping. We noticed that Val and Janet had gone missing as we walked along the beach. They eventually turned up and it turned out had been rescuing an injured seabird and arranging for it to be sent to a Bird Rescue organisation at Sidlesham. The water looked a little grey cold and uninviting but Dawn, Philippa and Roy bravely took the plunge. After the picnic we headed back on a similar route to stop for tea at the seafront Cafe by Felpham Yacht Club. Continued good weather conditions brought 5 riders to the start point, only to find the trip in jeopardy due to the non arrival of the advertised leader. After some discussion I was co-opted as leader (there were no other volunteers despite my entreaties), and we set off rather later than planned towards the advertised destination of the Winterton Arms at Crockerhill. We went out by way of Middleton village, Yapton, Maypole Lane, and then round the back of Barnham via Woodside and Orchard Way to end up in the old part of Eastergate. As we passed Eastergate church the welcoming sight of the Wilkes Head pub proved too tempting, and as we were running late anyway, a decision was made to terminate the ride there. We noted that the Wilkes is a regular destination for evening rides, but has not appeared at all in this years programme. Thus we felt we were correcting that oversight. For the return trip, John decided to leave the group in favour of a longer and faster circuit via Oving and Colworth, whilst the rest of us took to the tracks behind Westergate school to emerge on the main road at Woodgate. From there some lively running ensued as we headed straight down a strangely quiet A29 all the way to Bognor. Returning to Felpham via the cricket pitch we had completed a modest circuit of only 13 miles, although somehow it seemed much longer. the other DA attendees were already tucking into their picnics. including Jim and Irene on their new motorbike. Harvey led from the pond and was joined by Colin, Gill and Steve Thomas. The route took in Madehurst, Whiteways and then down to Houghton and across to Bury and round the lanes via Coldwaltham. It was decided not to stop for elevenses but come direct to the picnic at Wiggonholt Common. The group joined the Chichester group for the return and cycled into shower clouds massing over the downs. There was torrential rain while cycling up Houghton Hill and the group decided to abandon the planned Arundel tea stop and head directly home. We were again fortunate to enjoy excellent cycling weather for this ride and 5 riders set out for Slindon by way of Bilsham, Yapton Church, Walberton, and Fontwell. From there we crossed under the A27 via the tunnel to emerge at Park Pale. Our route then took us along Slindon Bottom Road, a very picturesque lane through Slindon Woods which skirts the perimeter of the pale. On leaving the woods the ruined Folly on Nore Hill was clearly visible to the north. We then tackled a challenging double climb over Court Hill and College Hill to reach Slindon village. Gravity then ensured a fast run down to the crossroads before the final hill climb to reach the Spur. The return route was via Slindon Common, Tye Lane, Walberton Pond, Barnham and Yapton and the round-trip mileage was 19.5. With strong wind and torrential rain not clearing in the end until lunchtime, this Ride was cancelled. Colin led this ride on behalf of Arthur who was away. Weather was torrential rain with strong winds in the morning but clearing to sunny spells in the afternoon. Only new member Mike Trussler turned up to join Colin. The group stopped for elevenses at Horndean Garden Centre and then went on to Wickham for lunch at a Pub. A new post has been made for Sunday July 10 by Avryl which I have edited to put it in the right order. Find it by scrolling down to the 10th. Four riders left The Fox in glorious evening sunshine, although in an attempt to tack against quite a strong headwind we followed a north-westerly route. I was stand in leader for Edwin, who was unable to make it. We skirted north Bognor and passed the thatched properties of North Bersted conservation area, noting that the village pond had succumbed to this long spell of dry weather and completely dried up. We then headed via Shripney and Woodgate to Hook Lane and Aldingbourne village, where we paused to read the newly placed information board at Aldingbourne Tote Copse Link to website,and carry out some minor adjustments to Val's new bike. A quick cut along the bridleway which was once part of the reserve runway at RAF Tangmere brought us out to the Air museum and direct to the Bader Arms. Once again the Chichester contingent (both of them) had pipped us to the post. Our return route was via Oving and Colworth; by this time the wind had dropped and the view across open country was spectacular, with a full harvest moon low in the sky to the east, and the sunset still glowing behind us. From Tangmere we did not see another moving vehicle until reaching the cycle track at Elbridge. Total mileage recorded back to the start point was 16.8. There were 2 on this ride, Jill and the leader Colin. Weather was fair and warm. An elevenses stop was missed out and the group went straight to lunch at the Half Moon, Midhurst. There were 4 riders starting from Chichester, the leaders Freda and Jim and Avryl and Mike Trussler. Weather was very good with fine sunny skies. The group rode out via Cocking and stopped at the Moonlight Cafe for elevenses. The ride continued on lanes via Bepton to the Half Moon and met up with Alan and Eric who made their own way and the group from Walberton Pond, Colin and Gill. The return route joined the others on a track round the back of Cowdrey to Amersham. The groups then split with the Chichester group heading back on the Heyshott Cocking lane to stop for tea at West Dean Gardens.